Purified recombinant fragment of human CD307E (AA: extra 16-158) expressed in E. Coli. 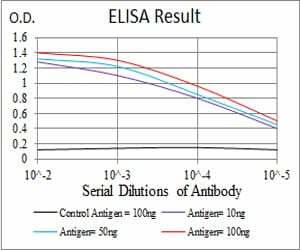 1.J Immunol. 2016 May 15;196(10):4064-74. 2.PLoS Pathog. 2015 May 19;11(5):e1004894. 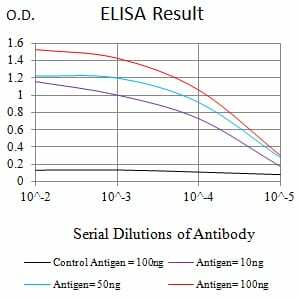 Figure 2:Western blot analysis using CD307E mAb against human CD307E (AA: extra 16-158) recombinant protein. (Expected MW is 42.4 kDa). 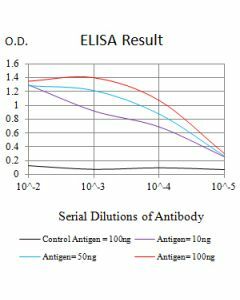 Figure 3:Western blot analysis using CD307E mAb against HEK293 (1) and CD307E (AA: extra 16-158)-hIgGFc transfected HEK293 (2) cell lysate. 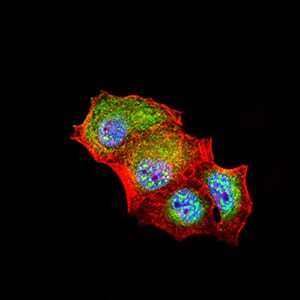 Figure 4:Immunofluorescence analysis of Hela cells using CD307E mouse mAb (green). Blue: DRAQ5 fluorescent DNA dye. Red: Actin filaments have been labeled with Alexa Fluor- 555 phalloidin. 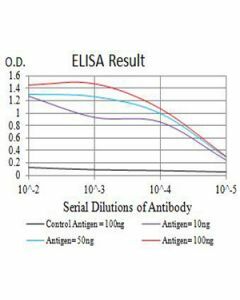 Secondary antibody from Fisher (Cat#: 35503). 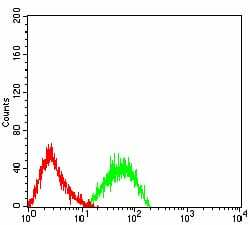 Figure 5:Flow cytometric analysis of HL-60 cells using CD307E mouse mAb (green) and negative control (red).